"...somewhere between now and then in the hours from dusk to dawn, - where no-one is quite what you think, and nothing is quite what it seems." When I first had a piece published by ConHome, an old hand emailed to say "whatever you do, don't read the comments. But if you must read them never respond as it will only encourage them!" Try as hard as I might, not taking a peep at what people were saying about me proved impossible and once you start reading it's impossible to stop - somewhat akin to a dog returning to his vomit! I have however resisted the temptation to respond and I have not used sock puppets to respond on my behalf; I will happily leave such self-flagellation to others! The comments section however is a wonder to behold. First there are perfectly reasonable people who have taken the time to read your contribution and who post a coherent and thoughtful reply. Some are in agreement, many are against - but they have taken the time to read and consider your point and have replied in similar vain. To all of those, thank you! Then there are the others, which fall into several categories. "Mr Kennedy is simply another Cameron loyalist and his faux outrage is hot air." "The first are the 'laptop warriors'- people who sit behind keyboards firing off angry and accusatory emails and telling others what they are doing wrong, but are seldom willing to do anything positive themselves." Now, taken as a whole (which is how sentences are meant to be taken), it should be clear that I am not attacking "laptop warriors" per se, but more precisely those who "fire off angry and accusatory emails, telling others what they are doing wrong, but are seldom willing to do anything positive themselves." The clues are out there! Now this really winds them up (and does so every time I write it - which is why I keep writing it as I love watching the faux outrage). My irritation is not with people who post comments, or with people who criticise the work of others, my irritation is very specific - those who fire off accusatory emails without lifting a finger themselves. Put up, or shut up! "Now there are two groups I intensely dislike....."
"Okay, so firstly you no doubt wrote this piece on a laptop so what exactly distinguishes you from those you "hate"? Now this is quite interesting. Not once did I use the word hate, but the commenter actually went so far as to put the word into speech marks to add validity to his fantasy, which then prompted two or three others to jump on the same bandwagon and express outrage that I should hate them for typing on a laptop. What do they say about "if you repeat a lie often enough, people will believe it, and you will even come to believe it yourself."? What's my conclusion having typed up all of this? I think my friend comments were right all along! Last night I was forwarded an email by someone in the local Leave Campaign and asked to respond. 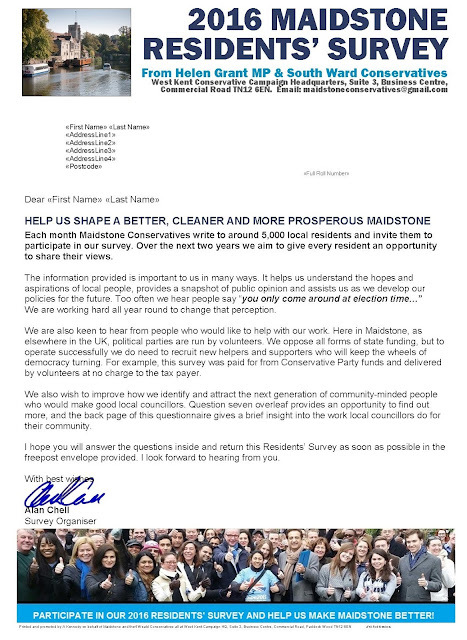 The sender claimed to be a former Tory who was "never going to vote Conservative again". The reason? Apparently "David Cameron is a coward who has sold out Britain. The Conservatives are pathetic traitors and only UKIP can save the world." Now there are two groups I intensely dislike. The first are the "laptop warriors"- people who sit behind keyboards firing off angry and accusatory emails and telling others what they are doing wrong, but are seldom willing to do anything positive themselves. The second group are those who play the man and not the ball. I am a feisty campaigner and happy to use every weapon in my armoury to help my team win; but I learned very early in my career that personal attacks (even when true and justified) not only backfire, but lower the standard of debate and debase politics. I spent quite some time this evening (in my own time) writing a strong reply. I don't think much of the Prime Minister's renegotiation, but he's delivered the referendum we wanted and has been true to his word. And in the words of Dan Hannan "sceptics should remember that"! Thank you for your email, the contents of which disappointed me. Allow me to explain why. The case for Britain forging a new relationship with the EU and the right of UK voters to express their views through a referendum is not something new. Many of us have been campaigning for this for 40 years. My personal campaign for a referendum dates back to 1986 when I remember being reprimanded by my pro-European MP Lynda Chalker for wearing a lapel badge at the Conservative Party Conference which read “Set Britain Free from the EEC”. For most of this period, Nigel Farage and UKIP were not around. In fact, they are relative latecomers to a cause which many of us have been fighting for generations. In the 1980s it took courage to be Anti EEC in the Conservative Party. It was seen as a “minority” interest only pursued by zealots and the extreme. Undeterred we held our ground, and through campaigning, leafleting, meetings, lobbying and decades of calmly making our case, we have now reached the position where we probably represent the majority view within Conservative politics. I am actually proud at being part of a team which helped bring this about – and we did this without Mr Farage and UKIP. Later in 2013 backbench Conservative MP, James Wharton, introduced a Referendum Bill to Parliament. This Bill set-out in detail the legislation for the referendum post the 2015 GE. Despite being a Private Member's Bill, the Conservative government found time in the parliamentary timetable to have the Bill debated and the first and second readings of the Bill passed in the House of Commons with the votes of Conservative MPs who voted in favour of the Bill at every stage. It was subsequently blocked in the House of Lords by Labour and LibDem peers. After the 2015 election, the 'same suspects' declared that the Prime Minister would forget the pledge - but it appeared in the Conservative manifesto. Then after winning the election it was thought that he would renege on his promise or find reasons to delay. Again they were wrong. The renegotiation was concluded and the legislation enabling the referendum was passed within 12 months of the General Election. By all means criticise the Prime Minister for not being tough enough, for asking too little or for not bringing home the deal you wanted, but don’t criticise him for dishonesty when he stated his intention to campaign for Britain to remain in the EU before the General Election and is now doing exactly what he said he would do. I will now deal briefly with the issues surrounding the conduct of the referendum, as in your email you inferred it was rigged or not being fought fairly. 1. The wording of the referendum was changed from “YES/NO” after the Leave campaign thought this would favour the status-quo, as people are biased to the positive option on a ballot paper. The final wording of “Leave / Remain” was the Leave campaign's favoured option. 2. Calls by opposition parties to extend the franchise (allowing 16yo’s and foreign nationals living in the UK the right to vote) were rejected. Again, the Leave campaign supported this as it was generally felt these groups would favour a Remain vote. 3. Rather than officially backing the Remain Campaign, the Conservative Party declared itself “officially neutral” with members, councillors, MPs and staff free to campaign for either side. 4. Government Ministers were also set free to campaign against the Prime Minister without having to resign their posts, another key concession from the government. In your email you stated that millions of people think like you and everyone you speak to wants “out out out”. If this is so (and I hope it is) then despite all your suspicions we will win the referendum and Britain will leave the EU. And you will have the Conservative Party to thank for it. If however Britain votes to remain in the EU then we must accept the will of the majority. After all, in your email you speak of the government "respecting the will of the people”. That applies to both outcomes. Thanks to this government and my party – you will have a vote for the first time in 40 years and your vote will be worth as much as the Prime Minister’s! This referendum will not be won by sending abusive emails accusing the very people who enabled this referendum to take place of being traitors. It will be won by standing in the freezing cold at railway stations at 6am, convincing commuters that their jobs will be safe. It will be won at street stalls in our major towns and High Streets on wet and windy Saturday mornings, convincing shoppers that the economy will be prosper and their futures will be secure. It will be won tramping from door-to-door in the dark, talking to voters and answering their concerns. This is what I and hundreds of people like me have been doing for many years. If you feel as strongly as you say you do, you would be very welcome to join us! 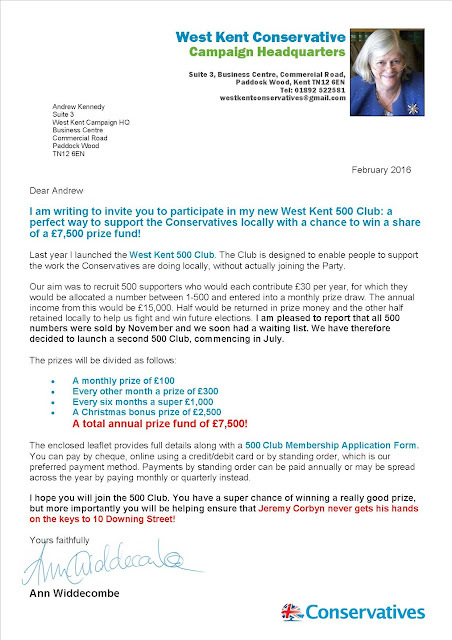 Regular readers will know that last year, with the support of Ann Widdecombe, West Kent launched a 500 Club. By November all 500 numbers were sold at £30 each, producing an income of £15,000 per year. Of this £7,500 would be returned in prize money and the remaining £7,500 donated to Association funds. By the end of January we had 120 people on the waiting list, so we have now launching a second 500 Club in July,on the same terms and conditions as the first. 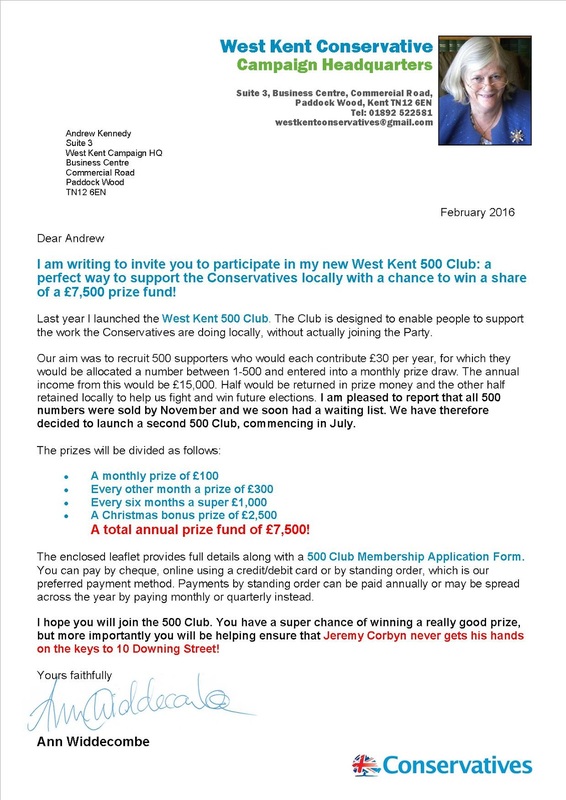 Having targeted paid-up Members and Registered Supporters for the first 500 Club, we are now targeting lapsed members and those who display window posters, deliver leaflets or assist with telling and clerical work. 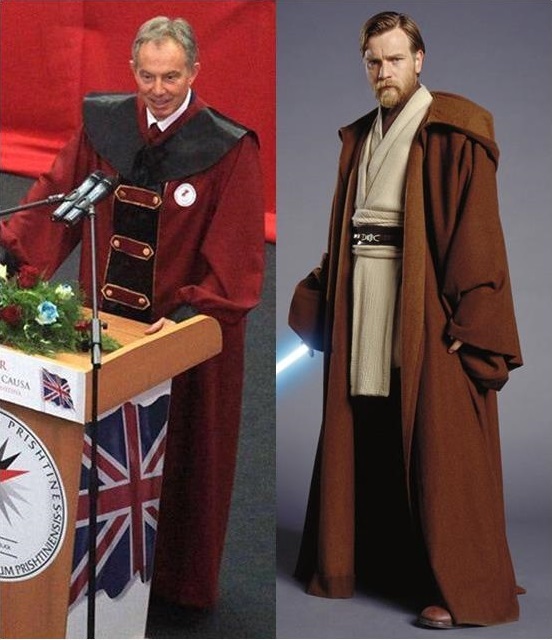 As Tony Blair's dreams of becoming President of Europe fade into a distant memory, he turns his attention to more ambitious plans. Around 50% of our local membership subscriptions fall due in January. Of those 396 pay by standing order and 676 by cheque. Our membership renewal letters went out in the second week of January, and I am grateful to the 416 members who replied and renewed their memberships over the last four weeks. Today we are posting out a "first reminder" to the 260 members who did not respond to the original letter. Now I appreciate all the usual caveats; some people (particularly those on fixed incomes) are short of cash after Christmas, sometimes Royal Mail fail to deliver, letters "cross in the post" and often our more elderly members simply forgot to respond. Notwithstanding the above, sending reminder letters is an expensive business. There is the cost of printing the letter and renewal form, the outer envelope and the BRE and, of course, the postage. As well as a morning of a volunteer's time to pack them. In total we are probably looking at £1 per letter not including my time and Jon Botten's time in downloading the data and writing the letter. and 2 Members of Parliament! It's one thing spending time and money for rank and file members who have forgotten to pay, but we really shouldn't have to waste resources on executive Members and elected representatives! Another row is taking place this morning on Conservative Home about the forthcoming Feldman Review. My position on this is well known and set-out in my own article on ConHome in August last year. If you haven't read it, see HERE. From reports I have received about last weekend’s meeting with Area and Regional Chairs, my submissions seem to have been accepted as the basis for reform with one or two caveats. For example (and probably out of character for someone who takes a radical approach to party organisation) I have some concerns about the implementation and management of a national membership database, and those concerns were set-out HERE. This article is worth reading for any involved in membership collection. I am not aware that any of my concerns have been properly addressed. Running five Associations in Kent whilst dealing with dozens of others on a regular basis I realise two things. 1. What a joy it is to work alongside people who are selfless in their dedication to the Conservative Party and who willingly rise to every challenge. The Association with 400 members and a near full slate of Conservative councillors who don't think they can deliver more than one or two wards of GOTPV letters. Or the Association refusing to support our excellent PCC candidate as their Management Committee have decided unilaterally that they don't like the PCC position and have therefore 'opted-out'. Or the Association which has refused to pack or deliver GOTV letters as they don’t like the colour of the envelope. I have little doubt that the above Associations will be first in line demanding their rights and autonomy once the Feldman Review is published. Whatever comes out of the Feldman Review must address these failures. Yes (apart from people like me) they are all volunteers. But when one accepts elected office (either as a councillor, branch or Association Officer) one also accepts the responsibilities and duties which come with that office. And this includes supporting the wider aims of the Conservative Party. If you are an Association Officer it is quite frankly not acceptable to opt out of an election campaign because you don't like the democratically selected candidate or you don't think the office should exist. These projects involved 220 volunteers. Some took work home, others came into the office every day for up to six hours a day, or popped in as and when they could. Between them I have calculated that these 220 volunteer envelope writers and packers worked 1,500 hours this week for the benefit of the Party. Had they been paid, even at minimum wage, the cost would have been £10,200. But of course we don't pay them a penny, and what's more they actually pay us an annual subscription to support our work! I have no romantic view of the present Association-based structure, and I hope Lord Feldman and his team are radical with their recommendations, but I hope we don’t destroy or demoralise or demotivate all that is good with the voluntary party as we seek to address those who don't perform. The three small words which fill me with more angst and irritation than any others are "Can You Just....?". During a recent parliamentary by-election my life was plagued by a constant stream of people coming up to my desk and saying, "Andrew, Can You Just....?" The team of volunteers working closely with me tried to defuse my irritation by producing a lovely laminated poster which I found attached to the wall one morning. It showed a happy relaxed photograph of me with the initials "CYJ...?" alongside. By the end of the campaign I had scrawled "NIFC" underneath. You can work out for yourself what that meant! "Can you just knock up and print off a flyer for my lunch next week?" In almost every case the person making these late demands have known for weeks or months they they needed something done, but rather than make their request in good time allowing us to feed it into our schedule, they invariably phone up with 48 hours notice saying how busy they have been and expecting us to jump at their command. They think that Jon and I are sitting at our desks with our thumbs up our backsides whiling away time and hoping for someone to call and give us work to do. I actually find this assumption quite insulting. Interestingly, the people who make these demands hardly ever come into the office to help. Maybe if they did they would understand how the West Kent machine operates. 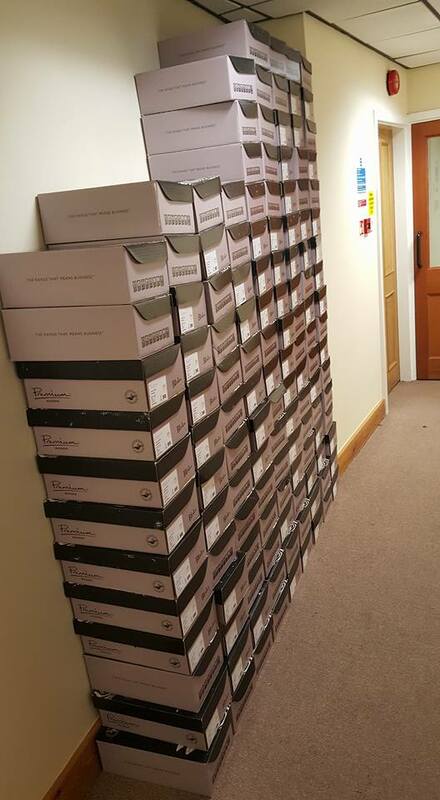 On Monday last week we took delivery of 88,000 cream C6 envelopes which have to be hand-addressed as part of the Kent-wide PCC campaign. By Thursday these had been dispatched to a team of 128 volunteers who had each offered to hand-write 500 or 1,000 envelopes. As Jon was meeting and greeting the volunteers and handing-out their packs, our weekly volunteers were packing 5,000 Voter ID Surveys for a target ward in Maidstone, which had been printed on Monday. Meanwhile, I started work on mail merging 50,000 letters to strong pledges encouraging them to apply for a postal vote. These will be packed by a team of 40 volunteers working in shifts on Monday, Tuesday and Wednesday this week. As the volunteers pack the PV letters we will start printing 88,000 letters (in 37 versions) which will be packed into the hand-written envelopes the volunteers took away last week. Somewhere in this process we will organise 5 Association AGMs, send out membership cards and reminders, bank money, run an annual dinner, manage the Boris Johnson and Charles Moore events, arrange canvassing sessions and open and process 150-200 items of post every day. All of this works smoothly because every hour of our day is planned, capacity on our printing machines is booked weeks ahead, and our amazing team of office volunteers rise to the challenge each time they are asked. Jon and I pride ourselves on finding the time to do everything we are asked. With good planning yes we can, but without.... NIFC ! By now my colours are firmly nailed to the Vote Leave mast and I am pleased at how many of our local activists are also supporting the Leave campaign. I have, however, noticed something quite strange. There is a small group of councillors who are working tirelessly for the campaign, but have never responded to requests for help and support for our own party campaigns, such as local canvassing, P&CC campaign or our West Kent Back Zac Action Days. I am of course delighted these local "community leaders" are on board for Vote Leave, but it would be nice if they showed just 30% of this enthusiasm when the Party asks for their help. After all, without the Conservative name and brand, they would never have been elected in the first place! Be sure your Social Media sins will find you out! If you are a 'lefty' and you think it would be a good ruse to email the local Conservative Agent / Campaign Director and ask for an internship, at least have the sense to purge your social media beforehand, or your application might not reach the top of the pile. Maybe it's a sign of getting old (I remember my mother and grandmother both saying how fast the weeks and months pass 'these days') but grumpy Monday mornings turn into Friday afternoon with increasing speed, leaving Jon and I questioning what happened to the week. The volume of work is relentless and will only get worse in the weeks ahead. This week started mail merging letters to the Kent membership to raise funds for the forthcoming Police & Crime Commissioner Campaign. I am grateful to former Party Leader, Lord Howard of Lympne, for fronting-up the appeal. Example below. On Tuesday we finally completed the data entry for the last GE marked registers and marked PV registers. Data-capturing five constituencies worth (over 300,000 items of data) has been a mammoth task and I cannot express sufficient thanks to the team of over 40 members and supporters who came in day after day to get the job done. It is most unfortunate that we did not simply buy the marked registers in May (as we have always done in the past) when we could have completed the data capture over summer, but that's a lesson for next time! The middle of the week was dominated by our usual hard working teams of packers, who this week packed and dispatched around 12,000 items of mail. These included the 5,000 Lord Howard letters mentioned above, 5,000 Voter ID surveys, three local mailings for Associations and around 500 membership cards. Today (Friday) we took delivery of 88,000 envelopes which next week will be shipped out to 140 volunteers for hand-addressing to pledges as part of our 2016 election campaigns. When I posted a photograph of this mountain on Facebook someone commented that asking volunteers to hand-address them shows what "disregard" some people in the party (ie, me) have for our members. My response below! Surely no? If true, it is a classic example of wasting volunteer's time and the disregard certain elements of the party have of supporters! Andrew Kennedy what utter nonsense. We've been delivering hand-addressed pledge letter for five years now. It's nothing to do with disrespecting party activists and all about a form of communication which works. I actually strongly object to someone I have never met and who knows nothing about me or the work I do implying I get volunteers hand-writing envelopes as I disrespect them. The fact that I am able to raise a team of 140 volunteers happy and willing to do this, year after year, shows not only the strength of the team but the respect they have for my campaign skills. "Disrespecting" people is sticking a computer produced label on an envelope and expecting voters to be fooled by it. Mary Streater As a volunteer I am aware that some elements of the party may disregard us - but that is so very not true of Andrew Kennedy. It is a joy to volunteer in the office he runs as he will never waste volunteers time or efforts as he always appreciates the work we do. I just wish all Agents had that approach. Also this week were two Association's Local Government Committee meetings, a Management Committee Meeting and a fleeting visit to Crowborough Constitutional Club to help our neighbours celebrate a stunning by-election victory, for which West Kent did the design and printing. And we also sent the first 2016 local government election leaflet to print! 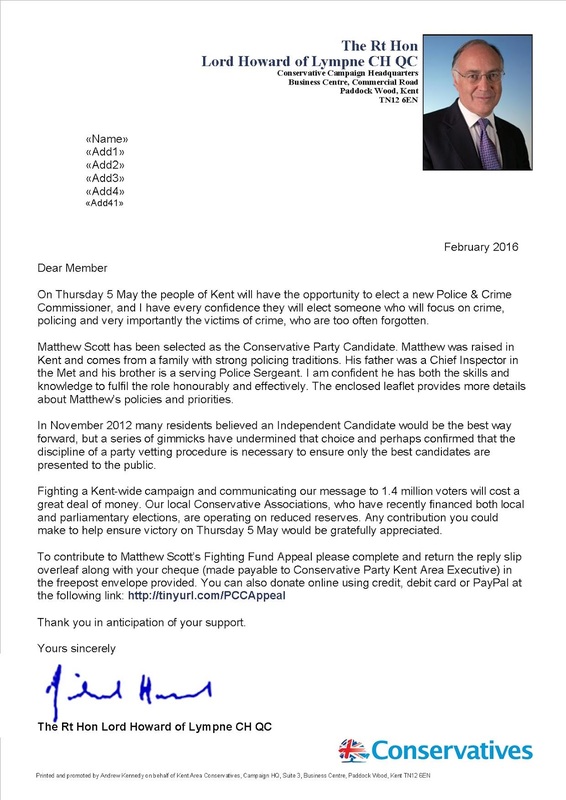 Finally this week Jon and I turned our attention to next week's big project; a postal vote recruitment campaign aimed at around 70,000 carefully targeted Conservative pledges across Kent. Bring it on! Whose bright idea was it to hand-write 88,000 envelopes to pledges?